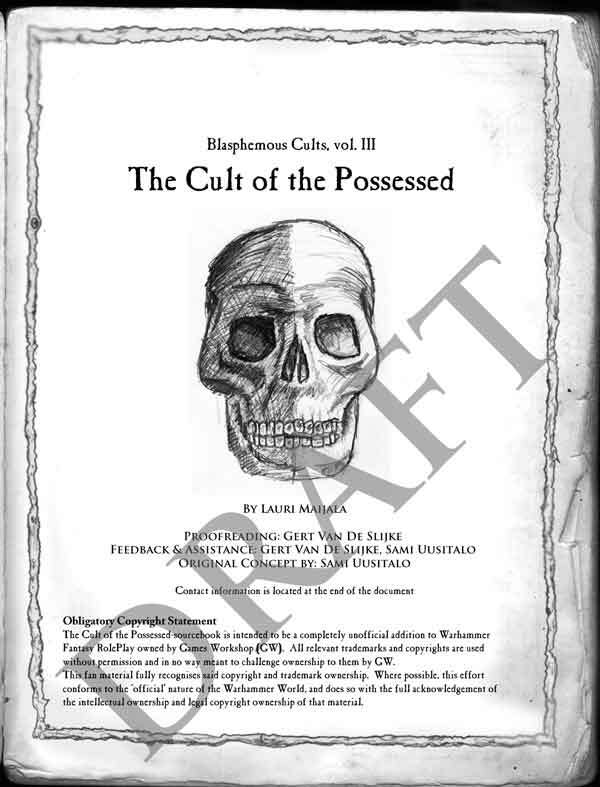 I actually managed to do the last touches on the Blasphemous Cults 3: The Cult of the Possessed last night but was too tired (and anxious to wake up for a Reckless Dice Podcast) to put it online. But with a two hours of sleep (thanks to my son) and an energy drink I am more than ready to present it to you! What’s the Cult of the Possessed about? CotP is an indenpendent sequal to the series started by Sami Uusitalo with his Blashpemous Cults (download it from Strike-to-Stun HERE). It presents a cult of Chaos very different from those seen in current line of products resurrecting an old god of Chaos called Malal. It deals with how the cult is perceived by servants of Sigmar and by the cultists themselves and gives you ideas how to fight Chaos with Chaos. I am first to admit that the idea is not exactly my own, original or even canonical. But as it nevertheless made an interesting supplement I really don’t care. The way I dealt with these two beings is not for everyone but I still think it was a valid choice. Certainly after adding some Cthulhu Mythos into the mix too. For which edition is this supplement? As I have stated with the one-sheet I like all editions of WFRP and will not put any gaming info on my own works. This frees me from spending time to search different rules for these things so I can use that time to write. I will say however that the supplement includes references into the Storm of Chaos (as it is quite relevant when talking about Be’lakor). This however should not be a problem and could be presented as visions of future if needed. For gaming purposes I recommend gamers to check WFRP2 – Tome of Corruption for possessions and exorcism. Sami Uusitalo told me that there’s some similar stuff in FFG’s Warhammer 40K rpg product line. I would like to thank all of you who helped me with this product whether it was proofreading, editing advises or much needed commentary. Without you I would have lost interest! As always I would be more than happy to receive comments and suggestions (or even an occasional “hello!”) about the product. As some of you might have noticed I answer to all emails and usually pretty promptly. It Lurks on the Threshold! First draft of the layout on the Cult of the Possessed is finished. 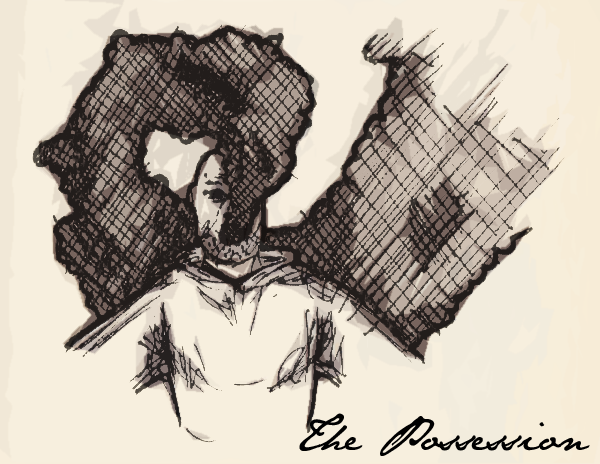 It’s looking pretty good already but I think it will need some additional art-work to make it more readable. I still think/hope I’ll be able to release this at the end of this month. I’ve been writing this piece from early march. If my memory serves me right and by “writing” I mean “started and then forgot all about it for months”. Proof-reading is still “on process” and some changes might be made. Hopefully these will mean some more original art! In other news – yet another one-sheet was added. This one called The Curiosity of Men that is a kind of like a Pandora’s Box.